A M Clocks is an Illinois Corporation located in the Elk Grove Industrial area near the Chicago O'Hare airport. We are now servicing the North Side of Chicago plus as always the North and Northwest and West Suburbs for all your Grandfather clock needs. Give us a call to set up an appointment at (847) 439-3636. We are a Howard Miller Dealer and also one of their authorized Repair Centers for the Chicago area. We have been working with Howard Miller for over 14 years now. 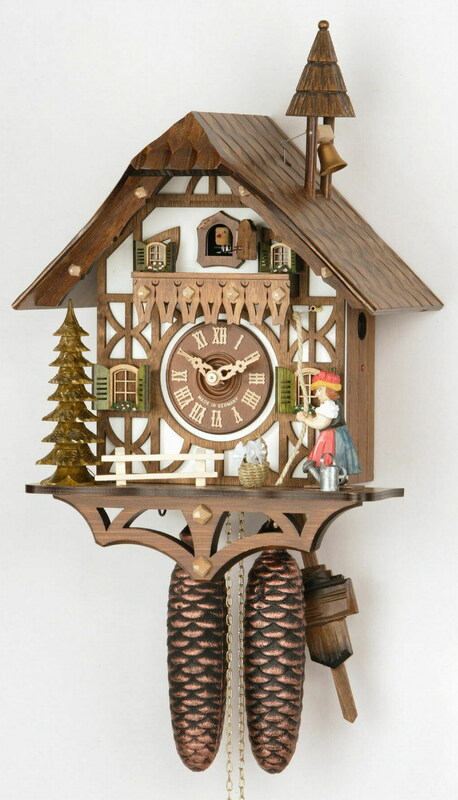 August Milz, the President of the firm grew up in the Black Forest of Germany and learned his clock trade in a cuckoo clock factory and after finishing his apprenticeship he worked in his father's cuckoo clock factory. In 1957 after becoming a Master Clock Maker he came to the USA and opened several clock repair shops. Operating a well established clock repair shop, repairing all kinds of clocks and knowing the Black Forest clock industry as well as we do, it comes as a natural, that in cooperation with two of the well known and old clock factories we now can offer the whole line of Black Forest clocks on the Internet direct to the consumer at WHOLESALE PRICES. We also have 2 other Master Clock Makers. One is from England and the other is from former USSR. We have a certified clock maker also from the U.S.
Feel free to contact us by e-mail, phone or fax. If you have any questions or comments. We look forward to serving your needs.